The photo below is from a typical tram stop in Vienna. But what do all those words, symbols, and various signs mean? 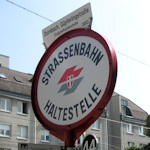 Well, the large black lettering in the red-rimmed oval (“Straßenbahn Haltestelle”) means “tram stop.” Just in case you weren’t completely sure. The letters in the blue-rimmed semi-circle say “Autobus Haltestelle”. if you guessed “bus stop”, you’d be right. So this particular platform doubles as both a tram and bus stop. The name of the stop or station is on every sign at the top. In this case, it’s Volkstheater. The red number 49 tells you the name of the tram line that halts at the stop. The blue 48a is the name of the bus line. Should you see a similar sign with the letter N and a pair of cat’s eyes, this indicates that a special night service stops here, too. Below those symbols you have timetables for the relevant trams and/or buses, giving the names of the stops on the line, the time it takes to reach each of these stops, and the intervals between trams/buses for various periods of the day. What you can’t see too well in that top photo are two smaller signs pointing out from the post, as shown above. These signs repeat the number or letter of the tram’s line, point in the direction the tram leaves from the stop, and list the name of the last station on the line. The number on the left is the bus or tram line (our 49 tram and 48A bus). The words in the middle are the final destination (the Ring, Volkstheater stop). And the number on the right is how many minutes until the next vehicle arrives. This is why the number might change unexpectedly. So if it jumps from 4 mins to 10 mins, it simply means the next tram is 4 minutes away and the one after that is 10 minutes away.